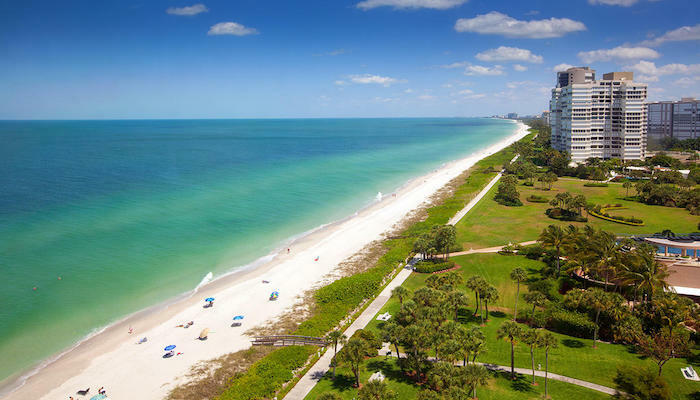 Sanibel/Captiva islands are about 15 miles south of Fort Myers and 45 miles north of Naples. They are popular visitor destinations. Sanibel is reached by a dramatic causeway from the mainland. It is quite undeveloped, with a huge part of the island conserved as part of the JN Ding Darling Wildlife Refuge. From the causeway, it is about 10 miles down island to Captiva, which is even more remote, un-developed, and pristine. The northern 2 miles of Capitva, toward the tip, is privately owned by the South Seas resort, although one can run on the beach! Run the bike paths. See this interactive map. There are 22 miles of bike paths on Sanibel, mainly paralleling the road. Note there aren’t really ocean water views most of the way. The most seamless section is Sanbel-Captiva Rd., heading north for 7 miles from Rabbit Rd.m to Blind Pass (Bridge to Captiva). Distance segments. 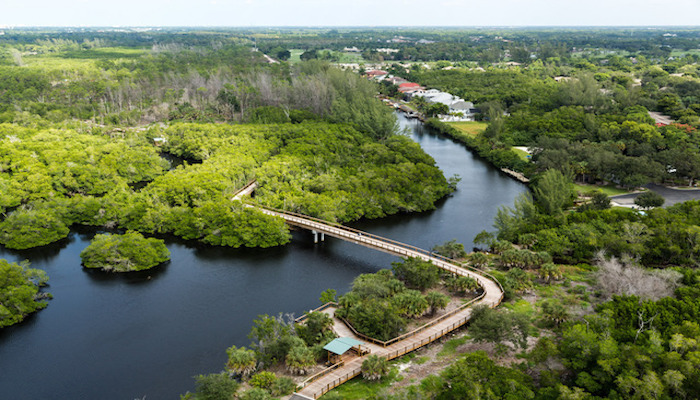 Captiva Dr.: The 3.2 miles on from Blind Pass Bridge crossing over to Captiva, to the South Seas Resort is very pretty, with a combination of open areas with and pleasant foliage. Combination of bike path and shoulder on the road (narrow in spots). The nicest section is the 1 mile section along the water, just south of the Green Flash, with ocean views. Running on the beach. The nearly 15-mile continuous beach is runnable, depending on tides and conditions. Best at low-ish tide. Sloped in sections. Watch for shells! This is about as pristine and undeveloped as beach gets in Florida. A great section is the 5 miles from Blind Pass (Captiva Bridge) to the northern tip. Parking can be a bit of a challenge in Captiva. There are designated parking spots on Sanibel (Bowmans, Tarpon, Lighthouse are some of the largest lots). The widest sections of the beach are from Bowmans to Rabbit Rd. A special treat at sunset! Wildlife Refuge. 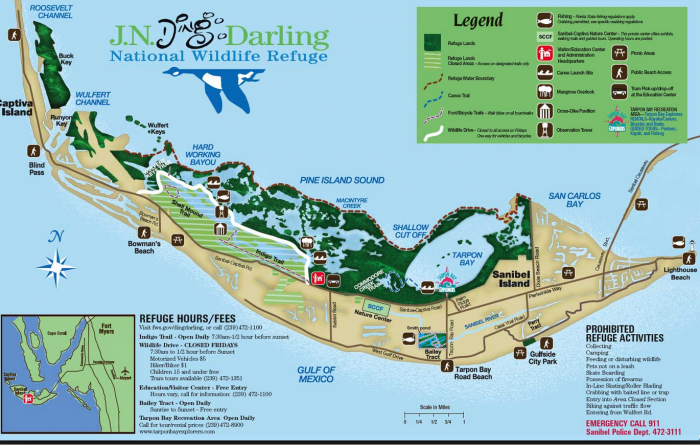 There are several sections of the Wildlife Refuge, all over the island, with trails for walking/biking/running. A favorite option is the 4 mile loop road from the main Refuge entry point (see map). This are wonderful spots along here for wildlife viewing. 250+ species of birds! Admission required. South Seas Island Resort. 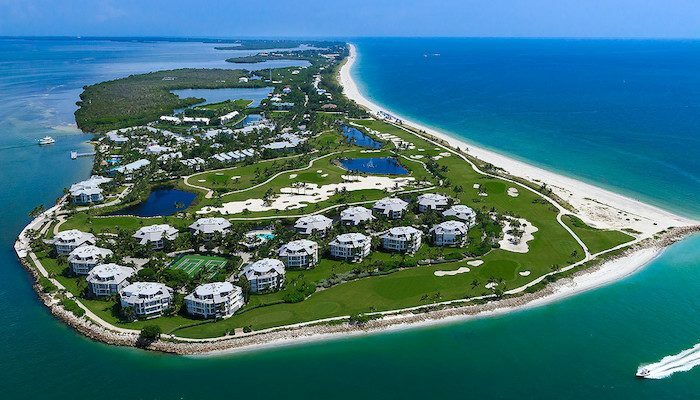 This is a large and popular resort, spread over nearly 2 miles at the northern tip of Captiva. One must be a guest to run on the hotel grounds. The ~2 mile “Plantation Road” is popular with hotel guests, as is the ~1 mile loop around the perimeter of the golf course. Combine the road with the beach for a nice run. Wulfert Rd. A quieter road option, running 2 miles through a residential neighborgood from its start off the Refuge to the end. Note: Running/walking is NOT permitted on the causeway between Ft. Myers and Sanibel (although biking is).